Update 06/02/2017: Dynavax released more data for ASCO17. Now SD-101 is getting 100% ORR 7 out of 7 anti-PD-1 naive patients, including 2 Complete response (29%). 2 PR (17%) and 5 (42%) “tumor shrinkage” out of 12 anti-PD-1 progressive patients. Poster data shows 5 SD (stable disease) out of 12 anti-PD-1 progressive patients. Update 03/06/2017: Dynavax released more data. Now SD-101 is getting 86% ORR 6 out of 7 anti-PD-1 naive patients, including 2 Complete response (29%). 1 PR and 5 stable disease out of 10 anti-PD-1 progressive patients. Dose escalation planned. Update 11/12/2016: Dynavax just released more data. Now SD-101 is getting 80% ORR in 5 anti-PD-1 naive patients. 4 stable disease out of 8 anti-PD-1 progressive patients. Dynavax just release early clinical data on its SD-101 and Pembrolizumab combo trial. You can find the press release here. More detailed efficacy and safety data can be found in this poster they presented at ESMO annual congress. No dose-limiting toxicities of the combination were observed in any dose cohort, and a maximum tolerated dose (MTD) was not identified. No immune-related adverse events were reported, and the most common treatment-emergent adverse events were grade 1-2 flu-like symptoms, including fever, chills and myalgia consistent with the engagement of TLR9 and production of interferon alpha. What’s more interesting is its efficacy data. It is only available for 5 patients of the lowest dose (2mg) cohort. In four anti-PD-1-naive patients, it achieved 1 complete response and 2 partial response. In one anti-PD-1 progressor patient, it achieved stable disease. 5 patients is really a small sample size. The market apparently is not impressed by this early data release. Stock price barely moved upon the news. It kept hovering near its 52-week low due to recent AdComm cancelling drama. 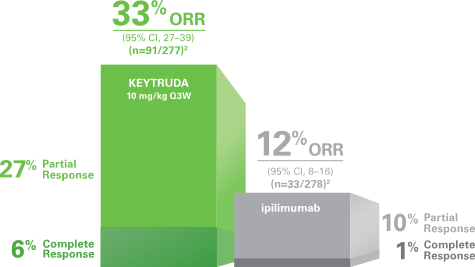 According to Merck’s Keytruda webpage, Keytruda has 33% (91/277) overall response rate in melanoma, including 27% partial response and 6% complete response. Based on these probabilities, I conclude the chance that SD-101 provides no additional benefit is small. On the other hand, SD-101 combo most likely provided additional clinical efficacy in treating metastatic melanoma. Will higher dose cohorts confirm the promising efficacy found in 2mg cohort? Will higher dose provide a dose response effect?